An incredibly tiring and emotionally draining day.... so much going on and no rest! Martha was a little tinker at dog training - she's hit her adolescence and forgotton every bit of her training! She's got a month to chill or I won't let her go to Crufts! 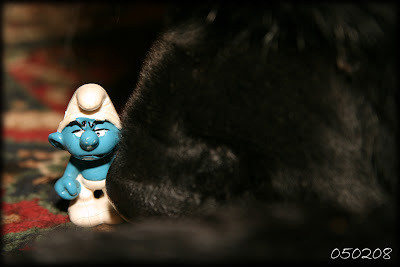 Grumpy smurf went on a little tour today and met Lola.... he didn't look thrilled! Here's hoping for less stress tomorrow and until then bring on the Pinot!